Antique - Royal Albert Crown China Tea Set - "Eton" Pattern #1270 - Manufactured per "Crown only" on Back Stamp, during 1896 thru 1905. Totaling (14) Pieces. One of Royal Albert China's Oldest Patterns, the "Eton" is a lovely Teal and White Pattern having Swags, Scrolls and Hanging Flowers, on a Scalloped China, with 22kt Gold Rims and Handles. In-sides of Cups and Sugar Bowl also have revealing Sections of Pattern. 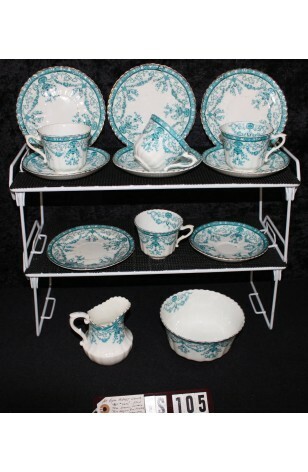 Teal Colored China Patterns are Rare, especially at this age. Cup Shape is very old style as well.. A Service for (4) Four. 4 - Bread, Dessert, Tea Plates - 6 1/8"